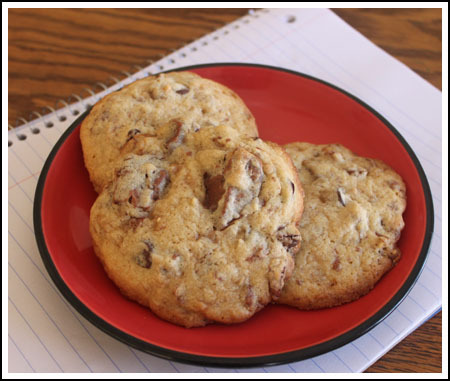 Toblerone Minnesota Munchers are drop cookies with chopped up Toblerone, toffee chips and pecans. Preheat oven to 350 degrees F. Line a cookie sheet with parchment paper. If you plan on chilling the dough, skip this step. In bowl of a stand mixer fitted with a paddle attachment, cream the butter and brown sugar. While the mixture is creaming, add the salt and vanilla, scraping down sides of bowl. Add the egg and beat just until it is mixed in. Thoroughly mix together the flour and baking powder. Using lowest speed of mixer or by hand, stir the flour mixture into the egg mixture. Stir in the Toblerone, dark chocolate chips, Heath bits and toasted pecans. Shape dough into large balls – a little larger than a golf ball, but way smaller than a tennis ball. Chill the balls of dough until ready to bake or bake immediately. To bake, arrange dough balls 3 inches apart on parchment lined cookie sheet. Press the balls down slightly to make flat tops. Bake for about 15 minutes on center rack. Makes about 20 depending on how you interpret my sizing of golf balls & tennis balls.